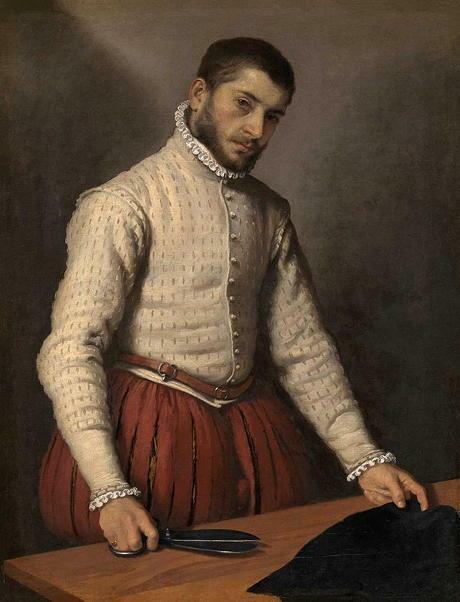 Giovanni Battista Moroni, The Tailor (Il Sarto, or Il Tagliapanni), ca. 1570. Oil on canvas. 39 1/8 x 30 1/4 in. (99.5 x 77 cm) © The National Gallery, London. NEW YORK – The dates of his birth – between 1520 and 1524 – and of his death – 1579 or 1580 – are not very reliable. Those were the good old times when not everyone was filed! To add to the mystery, half of the models he rendered immortal in portraits that hang proudly in the most prestigious museums in the world – going from the National Gallery in London to the Art Institute of Chicago, including the Städel in Frankfurt- are just as unknown to us. Even Vasari, whose <>Life of the Artists was the Who’s who of his time, does not mention him. We therefore have a lot to learn about Giovanni Battista Moroni, born near Bergamo, where his descendants still reside. His career evolved in a limited perimeter in Northern Italy, from Brescia where Moretto da Brescia taught him his trade, to Trento. This exhibition focuses on his portraits, among them the famous Tailor (Il Tagliapanni) which travelled over from London, accompanied by a series of accessories from the artist’s period to see how the artist adapted to reality in his own ways. • Moroni: The Riches of Renaissance Portraiture at the Frick Collection, from 21 February to 2 June 2019. Eva Reichmann, Wiener Library Head of Research, 1950s. Wiener Library Collections. LONDON – Simon Wiesenthal, the Klarsfeld couple, and Claude Lanzmann, as well as their dedication to unveil the truth on the Holocaust, are well known. And there are many more like them. This exhibition focuses on the pioneers – those who right after the Second World War - did everything to gather numerous documents on the Final Solution. The venue is hardly known to the general public. It is the Wiener Library, one of the most important archives in the world on this subject, founded by Alfred Wiener (1885-1964), a German Jew who set up in Amsterdam and later in London, who had accumulated traces of anti-Semitism that go back as far as 1933. Among these main players, Raphael Lemkin, who contributed to the legal definition of the genocide; Eva Reichmann who focused on gathering the first testimonies of the survivors; or the members of Oneg Shabbat, who buried a number of letters, posters, and photographs in cans and bottles of milk during the ghetto of Warsaw. • Crimes Uncovered: The First Generation of Holocaust Researchers at the Wiener Library, from 27 February to 17 May 2019. Louis-Léopold Boilly, The Poor Cat, oil on canvas, 31,9 × 40,4 cm. Courtesy The Ramsbury Manor Foundation. LONDON – The National Gallery has one painting which it is very proud of, Girl at a window, a grisaille bequeathed in 1945 by Emilie Yznaga, the duchess of Manchester. Suddenly the pretty Parisian is no longer lonely. An English collection made up of 18 works of art, built over a fifty-year period by British property developer Harry Hyams and protected by the Ramsbury Manor Foundation, will come join her. It has never been displayed before. Louis-Léopold Boilly (1761-1845), another great portrait artist, believed to have painted some 5 000 works and who escaped in extremis the infamous Committee of Public Safety, fascinated the public with his scenes of everyday Paris life in the country that was turned upside down, and coined the style and phrase ‘trompe l’oeil’. To give this small exhibition the full breadth of its value, the famous The meeting of artists in Isabey’s studio, portraying the “best and the brightest” individuals of the time – with Girodet and play writer Talma – is on loan from the Louvre. • Boilly: Scenes of Parisian Life, at the National Gallery, from 28 February to 19 May 2019. Can we express ourselves on walls? No way! The famous law of 29 July 1881 on the freedom of the press dictates strict rules for all urban posters or writing on walls. No doubt this was the reaction to the tendency of all citizens, throughout time, who have not hesitated to engrave their opinions on the stone of our walls. We have clear examples that go from Pompey to May 68, and to the samizdats from Eastern European countries. The basic version is graffiti: a drawing – at times obscene -, a sign, initials, with some samples from the pyramids as well as in old French manors. The work shows how these penknife marks became objects studied as patrimony. The object of the exhibition gains immensely from the great variety, going from the writings on Rome’s clay walls by Pinturicchio’s rivals, accusing him of being a sodomite, to the writings by the prisoners in the castle of If that immortalized the name of their sweethearts; including works by Pignon-Ernest, as well as the graffiti artists who invaded abandoned factories. • Sur les murs. Histoire(s) de graffitis, 190 p., €29.